As you approach there is a man pouring chalk, interpreting the tibetan mandala tradition. Here we see Jared's porcelain knick-knacks glued together, and painted . . .
Paper cut outs from magazine ads. Really great paintings, at first I thought it was a photograph, then a painting, then i saw the cardboard last. It seems like it could easily become a gimmick, but these still feel fresh. there were four or five of them hung in a row. Yep, I just couldn't get enough. Gotta love when old crappy cardboard sits in a nice white frame, and it holds its own. 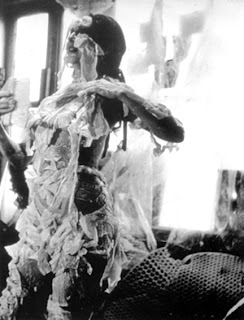 Kind of a new cyber take on Carolee Schneeman's 1967 Body Collage. and by Cyber i mean using old clunky office computers and keyboards, kind of like the Japanese cult Tetsuo: The Iron Man meets 3rd wave feminism? This piece was nice. A Lebanese artist currently working in Germany. The paintings resembles books, or magazines, about art. You could do a group show just using this trope. A small guy I found in a niche somewhere, didn't have a label. The moon made out of porcelain. Although at first arresting, (and of course I love the reference to a "too cool for school" rock band) it lost its appeal to me rather quickly. It is large, maybe 7 x 10 feet. detail of the painting above. the canvas is wallpapered with paintings of invoices, records, and statements. she had a large presence at Scope also. This painting was large. The paint comes out at least a few inches from the canvas in certain parts. Sasqatch sitting for a portrait, for an infrared camera . . .
A Mexican artist. the image above and below were hung together, represent different techniques: the first is a sculpture, the second an intervention. maybe I'm just trifling with details, after all, it can come down to simply a degree of preparation. I believe the chair has been modified with a saw, not actually buried in the brick floor. The artist says the chair represents pedagogical indoctrination. This one (which I love) is part of a Public Sculpture Intervention series. I'm nominating it for best in show . . . I couldn't find much on this young Chilean artist. These are digital print/painting hybrids, as explained by the accommodating Turkish gallerist. A problem with waiting so long to write is that I forget some of the details of these works. nevertheless they were sweet, I do remember that. This was a play on the paranoid idea that some Americans have that Obama is secretely a muslim infiltrator in the White House. here the artist depicts him removing his shoes for prayer, as if it were true. The image is perspectivally skewed, the floor is flattened down to form a surreal stylized dreamy effect. I want to thank the folks at X-ist gallery for spending some time talking with us. The A.M.F. Project presented DIY fashion of Krel2go, a project by Daria Brit Shapiro and Karelle Levy, involving custom fit knit garments made on the fly. Ok ok, I know what you're thinking (maybe), " another crocheted yarn artist?" Well this one combines a strange mix of video work with yarn. You have to go to his website to see what I mean, the video work is absent here. A close up of a fire extinguisher. Builds sets out of paper and other simple materials, for photos. Sort of a more magical, theatrical Thomas Demand. This picture, which was quite large, was from a series entitled Udongo. Its a wood sculpture with sand glued to the surface. A Brooklyn sculptor interested in horror and B-movies with a Paul McCarthy feel. A film maker who makes exquisite, quiet shorts. In the ones on display here there was always this tension between two people, with large amount of focus given to cues of an individuals' presence : footsteps in a stairwell, unrequited stares into a void, hesitation as someone is mulling over or deciding. There is a narrative, but it is buried under a dense language of filmic ontology. The piece pictured above, Traveling between Spring and Fall, has a man get fitted for a suit, lose his briefcase, arrange items on a dinner table with his mirror image twin staring at him, and tight rope walk between two buildings. In this 2 channel piece, "and/or", the man plays the character "and", while the woman plays the part of "or". He is restless, constantly jabbering, busying himself to no avail. She is pensive, waiting, quiet - both seem lonely as they brush by each other on the street. Back at ADA gallery on the way out, I found this pinball machine getting some attention from some kids. John at ADA says it's not quite done, and he had to fix a knob that kept falling off. other than that, the thing worked like a charm. What kind of style of decor would you call that? Arts and Crafts meets Neo-Rococo? Thanks for reading. I will soon post on more up to date shows. Until then, keep on truckin!